Along with sisterhood, there are many reasons why women seek membership in a sorority. There are endless opportunities for development in personal, professional, and academic excellence. Why be a Gamma Eta? The diverse women of Gamma Eta have different backgrounds and experiences, but they all have something in common: their strong values and ideals. Membership in Gamma Eta develops lifelong friendships, personal growth, professionalism, community involvement and much more. Through this experience, sisters of Gamma Eta live their pillars of Sisterhood, Leadership, Service, Diversity, Strength, Unity, Scholarship. Being a Gamma Eta is a lifelong commitment to a network of sisters. Beyond the collegiate experience, alumnae participate at the local, regional, and national levels of the organization. 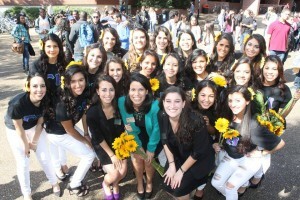 Alumna sisters are often mentors and leaders of undergraduate sisters and active members of their community. How do I join an undergraduate chapter? Gamma Eta’s membership process is slightly different from those of other Greek Organizations. Rather than hold a recruitment period during the summer, Gamma Eta recruits primarily at the start of the fall semester. The process from then on is a private affair until induction into sisterhood. If you have a Gamma Eta chapter at your school, look around for information session flyers, women in purple and teal, or sunflowers. You can also express your interest by contacting the chapter or speaking to a Gamma Eta sister directly about membership. What if Gamma Eta doesn’t have a chapter at my school? Do you have what it takes to be a Gamma Eta chapter founder? Take the next step and start a chapter at your institution.